One of many interesting money management strategies, used by many, if not most successful traders, is called Hedging. As the glossary tells us, it is a reinsurance / insurance trade, used to either double your profit, or lower your loss significantly. Hedging is basically the execution of a second trade in the opposite direction, if your previous trade is in-the-money. This means you have 2 open trades at one time, with the same expiration time. If one of the trades fails, the other is bound to be successful. Let’s say you buy a CALL option for 30 minutes. After 15 minutes we can see, that the price truly rises, but it seems, that it might go down again and make our trade unsuccessful. If we want to secure our trade, we buy a PUT option right now, this time for 15 minutes (the time remaining until expiration of the first option). This will ensure that if the price suddenly starts to fall and the first trade does not work out, then at least the the second trade has to and WILL work out and therefore decrease the loss. Do we understand? Let’s make an example. Bellow we can find examples of all the situations that can happen. 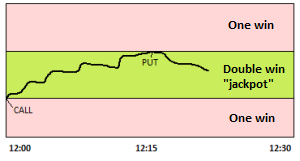 At 12:00 we buy a CALL option with expiration time at 12:30 with a strike price 1.2500 for $ 10 and profit of 80 %. At 12:15 we check and find out that our trade is going well. But we can also see that the graph seems to be slowly going back down and therefore we use hedging. We buy a PUT option with expiration time at 12:30, for $ 10 with profit of 80%. The price truly fell, but fortunately not by much. We won both trades. We ended up with $36. At 12:00 we buy a CALL option with expiration time at 12:30 on the price 1.2500 for $ 10 and profit of 80%. At 12:15 we check and find out that our trade is going well. But we can also see that the graph seems to be going back down and therefore we use hedging. We buy a PUT option with expiration time at 12:30, for $ 10 with profit of 80%. The price however went up. We won one trade, but not the other. We ended up with loss of –$2. The price has fallen bellow the value of our first option. We won only the second trade. We ended up with loss of –$2. This strategy is worth using, if the option is in-the-money in the first moments. If not, we can unfortunately do nothing about it. But if it is, we can secure / insure a profit, or even double it. If the price spikes extremely immidiately after the first trade was executed and it is almost clear that it (the price) will not return until the expiration date, hedging is probably not the best course of action. Hedging cannot be used as a stand-alone strategy. But if you already do have a strategy, hedging is a great thing to use in case of emergency. When we decide to insure with option for $ 10, we can only lose $ 2, but we can win $ 16. That is pretty good, right?